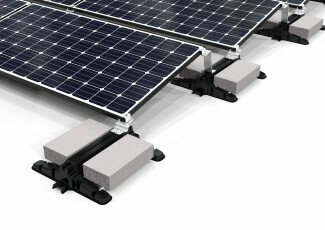 The POWER MAX™ PV Solar Mounting System is a fully ballasted high strength mounting structure developed with the professional installer in mind, featuring minimum components and no loose hardware. The POWER MAX is designed to provide a faster assembly and shorter learning curve. The modular design simplifies roof layouts, ordering and final installation while stackable components reduce shipping volume and provide easy transport of materials to the roof.